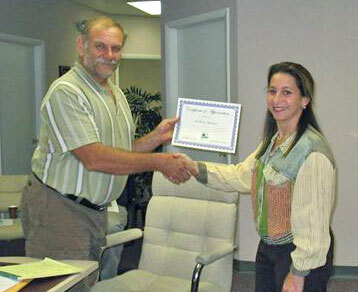 The Davie Area Land Trust Annual Meeting took place at the Farm Bureau offices on December 5, 2005. Davie Area Land Trust Chair Linda Greck presented Nick Maniatis, the first and founding Chair of the Land Trust, with a certificate honoring his service to the cause of land preservation in Davie and the surrounding areas. The certificate recognized Nick's contributions: "For your outstanding volunteer efforts as Interim Chairman of the Board of the Davie Area Land Trust, and for accepting responsibility of leadership through the initial formation of the only local land trust in South Florida." By voice vote of the attending members, Eduardo Tkacz and Judy Paul were nominated and voted onto the Board, replacing Mike Orfanedes and Michelle Bryson. The Board thanked Mike and Michelle for their service over the past year, wished them both well in their new endeavors, and welcomed Eduardo and Judy. The Board voted to maintain the current Officers, re-electing Linda Greck as Chair, Julie Aitken as First Vice-Chair, Nick Maniatis as Second Vice-Chair, Fred Segal as Treasurer, and Joyce Steward as Secretary. The Officers will serve until the next elections, scheduled for the 2006 Annual Meeting. Linda Greck thanked the Board for their efforts in 2005, and gave a brief report on the current state of the Land Trust. The 501(c)3 application filing, community outreach events such as the Orange Blossom Festival, the creation of printed materials, and the Land Trust's efforts at helping pass the Open Space Bond were mentioned as significant accomplishments for a fledgling organization. Tom Truex, Mayor of the Town of Davie, spoke to the Board and Members, thanking them for the volunteer efforts and wishing the Land Trust continued success in the coming year. Brady Revels, State President of the Florida Future Farmers of America, spoke to the Board and Members about the shared rural and agricultural values represented by the two organizations, and informed those present about the FFA Campaign for a state license plate featuring the FFA. Visit the Future Farmers of America web site. Minutes Approved – November 8, 2005 and November 22, 2005. Motion by Fred Segal, seconded by Michael Bartlett. Treasurer’s Report - $1,500 approximate balance. No approval yet of 501C3 from IRS. No resolution of invoice dispute with Rob Lyons although conversation did take place between Mr. Lyons and Fred Segal. Membership Report - Dr. Scott initiated discussion regarding the membership database. It is set up; will be web based with access only at the present time by the webmaster and the secretary. Dr. Scott offered information that 10 acres of land had been leased for 3 years to local farmers to be able to grow produce. Nominations closed. All voted in favor. Election of Officers – Motion made by Joyce Steward and seconded by Michael Bartlett to retain all current officers for another year. All voted in favor. Old Business – Michael Bartlett offered a presentation of the powerpoint to be used for speaking engagements. Special guest Mayor Tom Truex was acknowledged. Discussion was held regarding a presence by DALT at the South Florida Fair with a booth. Also a presence at the Water Matters Day and requesting waiver of any fees. Use of the website domain www.davieopenspace.com will be discussed at a future meeting. Appointment of the remaining task force member representative from DALT is postponed until the deadline of December 21 established by the Town. Discussion ensued regarding possible criteria to be taken by the representatives to the task force. Meetings in 2006 will be held on the first Monday each month in the evening and the 3rd Tuesday of each month at noon with location to be announced each month. Motion passed to keep the scheduled meeting for January 2 at Robbins Lodge. Motion made by Fred Segal, seconded by Nick Maniatis. Motion passed for 3rd Tuesday lunch meetings made by Fred Segal and seconded by Nick Maniatis. December 13, 2005 meeting will be held at Lum’s on Davie Road. Judy Paul requested attendees bring an unwrapped toy and nonperishable food items for EASE Foundation. A certificate of recognition was presented to Nick Maniatis for his service as the first Interim Board Chairman. Guest Brady Revels from the Future Farmers of America branch in Bushnell, Florida, requested the attendees support the attempt to have the State of Florida issue a specialty license plate acknowledging the Future Farmers of America. Attendees: Nick Maniatis, Fred Segal, Joe Phillips, Doris Monier, Linda Greck, Michael Bartlett, Judy Paul, Sam Scott, Eduardo Tkacz, Tom Truex.